In most forms of sports, be it baseball, football, soccer, even ice hockey, or gymnastics, there is a ladder system in place to bring those aspiring athletes into the professional ranks. A system designed to give the athlete the needed experience in their chosen sport, a system that allows the athlete to hone their skills and promotes them up to the next level and continues to do so until the athlete is competing at the highest levels his or her sport allows. For example, let’s briefly look at Major League Baseball. As is common, contrary to popular belief, a star athlete is not born, but rather made. Agreed, there has to be an inner talent, and a strong desire for the sport, but like anything else in life, we have to crawl before we can walk, and we have to walk before we can run. So, getting back to our example, most ball players start in a local youth league, and progresses up to Little League, from there it’s a spot on the High School team, the next step is collegiate ball, and finally into one of the professional organizations where the athlete works through several levels considered to be Minor League, before making their way into the Big Show. As in any sport, the numbers of athletes that successfully complete this journey up the ladder are much fewer than those that don’t, meaning only the most skilled, and talented athletes will take to the diamond with a starting role. This is a cold hard fact that holds true regardless of the sport, only the very best rise to the ranks of professional. When we look at the world of motorsports, namely, the Premier open wheeled racing series in North America, The Izod Indy Car Series, this ladder system is known as The Mazda Road to Indy. This system consists of three distinct levels of competition, The USF2000 Series, The Pro Mazda Championship Series, and the Firestone Indy Lights. All three series are designed to prepare the aspiring drivers for a career in motorsports. The drivers not only gain valuable time behind the wheel of the race car, but also countless hours of training in public and media relations. All three series are based on “Spec” type race machines, meaning the primary goal is driver development, and not some type of mechanical advantage. No one can step directly into the seat of a mega horse powered, technological wonder known as an Izod Indy Car without proper training, and the Mazda Road to Indy provides this needed training. Race fans attending the season opening Honda Grand Prix of Saint Petersburg, will get to experience the excitement, and close racing action this ladder system provides, all three series will run in support of the Izod Indy Cars and give the race fans three full days of racing excitement, and the opportunity to see firsthand the stars of tomorrow. Scheduled autograph sessions will Also give fans the chance to meet these stars of tomorrow, graduates of this ladder system include stars like Scott Dixon, JR Hildebrand, Josef Newgarden, and perennial fan favorite Tony Kanaan. 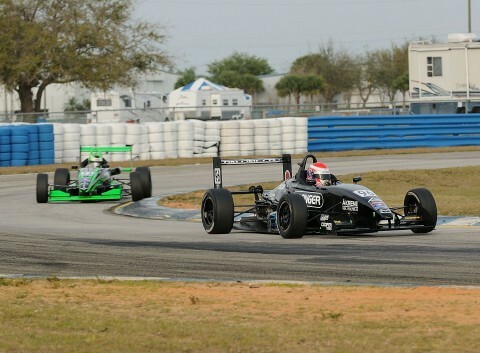 So, when you are sitting in the grandstands at St. Pete enjoying the warm Florida Sunshine, calling your best buddies back home to let them know you are at the Honda Grand Prix of Saint Petersburg, and they aren’t, and the next event on the schedule is the USF2000, Pro Mazda, or Indy Lights, don’t leave your seat to refill your favorite beverage or get one of those sausage sandwiches with peppers, and onions that have been cooking directly behind you for the past hour, and just the aroma has your mouth watering, Don’t go anywhere, if you do, you will miss some of the best racing, you will witness the entire week end. Bottom line, enjoy your week end, use plenty of sunscreen, have at least two of the sausage sandwiches, and make sure you don’t miss the three series that make up the Mazda Road to Indy.